When it rains, it pours. Colnago-CSF rider Manuel Belletti held his nerve to win the thirteenth stage of the Giro d’Italia this afternoon, making it two wins in a row for the host nation after eleven barren stages. The 24-year-old outsprinted fellow breakaway companions Greg Henderson (Team Sky) and Iban Mayoz (Footon-Servetto) in a tense finale in Cesenatico. After several days of excitement and unpredictability, the favourites were content to sit back and allow a breakaway an opportunity. After 60 kilometres of attacks on the flat Adriatic-adjacent roads, the right formula was achieved – a seventeen-rider escape, comprising no maglia rosa threats. It consisted of Belletti, Paul Voss (Milram), Joan Horrach, Serguei Klimov (Katusha), Danilo Wyss (BMC), Mathieu Claude (Bbox Bouygues Telecom), Kalle Kriit (Cofidis), Rubens Bertogliati (Androni Giocattoli), Sebastian Lang (Omega Pharma-Lotto), Cameron Meyer (Garmin-Transitions), Tom Stamsnijder (Rabobank), Mauro Facci (Quick Step), Greg Henderson (Team Sky), Craig Lewis (HTC-Columbia), Iban Mayoz (Footon-Servetto), Andriy Grivko (Astana) and Marco Marzano (Lampre). Two steep climbs inside the closing 70 kilometres interspersed the flat coastal fare but failed to split the escape. 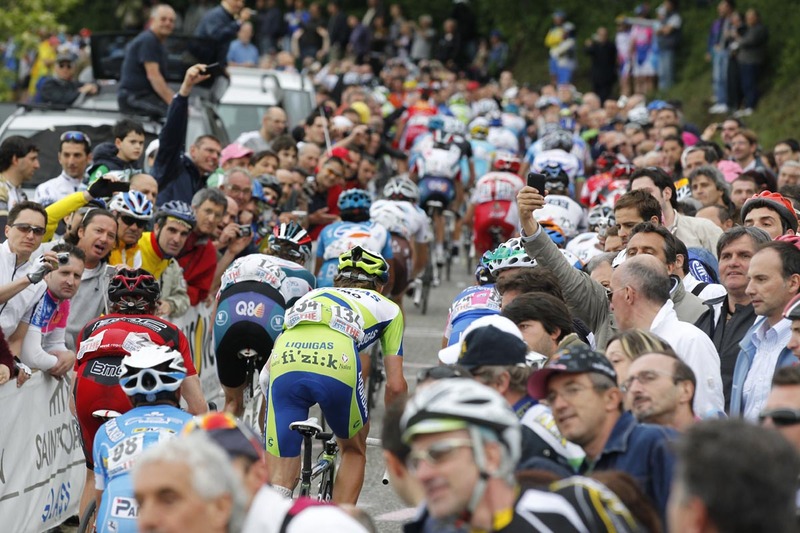 This led to a bevy of attacks on the twisting run-in to seaside Cesenatico, home to the late Marco Pantani. With ten kilometres to go, Kriit, Mayoz, Stamsnijder, Facci and Meyer pulled out a lead, but it was snuffed out with five kilometres to go. The breakaway spread across the road, reluctant to take the lead but just as unwilling to allow a companion any attacking leeway. Craig Lewis went for broke with 1500 metres to go, and was only overhauled two hundred metres from the line when Belletti – who was born in nearby Cesena – accelerated fiercely away from Henderson to take a comfortable win. “When Lewis attacked, I was only afraid of Henderson, so I stayed in his wheel. I went flat out. I jumped for the line, but I did not think it work,” he added. It is the 24-year-old’s biggest win – by some margin. Riding his first Giro, Belletti’s only previous victory came in a stage of an obscure Venezuelan race in 2008. As for Lewis, it was a case of so near, yet so far. “It was good for me, in my first Grand Tour, to be in an escape like that,” said the HTC-Columbia rider. “To attack like that was the only chance I had to win the stage because I knew the other sprinters were faster than me. My legs felt good today, but it was too far to attack in the mountains,” he conceded. Meanwhile, Katusha rider Vladimir Karpets finished in between the breakaway and the bunch, his 60-kilometre solo bid in no man’s land netting him two and a half minutes advantage over the contenders come the finish. The stage was also notable for the withdrawal of Briton David Millar, who abandoned the race at the feed zone. The bunch, containing all the big hitters, crossed the line just over seven minutes down on the stage winner. They will undoubtedly be more active tomorrow, as the race’s fourteenth stage takes the peloton over the climb of Monte Grappa before the finish in Asolo. Richie Porte’s maglia rosa will come under attack, but the Australian is ready to fight for it.